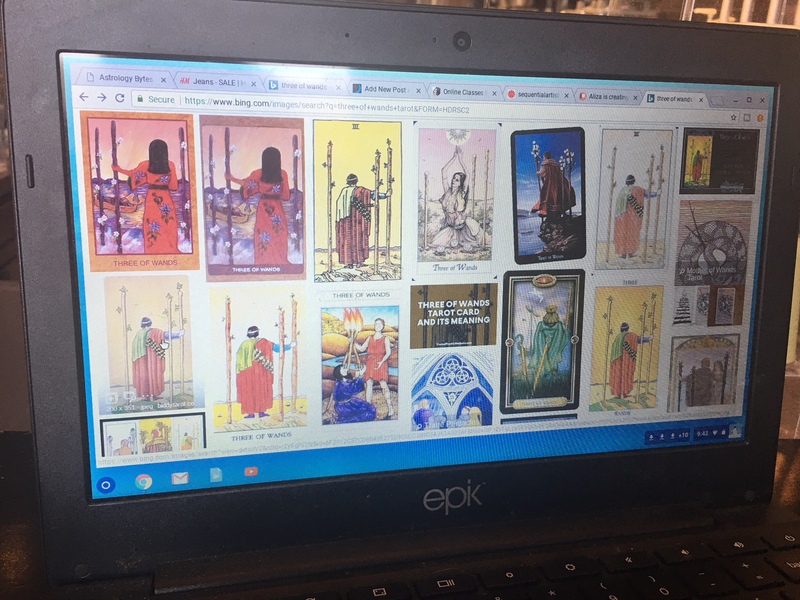 I let my Patrons know that I would be posting on my blog and social media today’s WEEKLY WONDER, the Tarot guidance for the week. You can become a Patron here. I put a cap on the $1 Tier but you can join us for $5 or higher. The reward tier details can be found on my Patreon page. Does it scare you. To think about it? Do you get anxious? What’s the concern? Well this week we are being urged to look ahead. The THREE in the Tarot is the first flowering of the suit. The two invites someone else in (a “Marriage”). The Three is what has arrived, developed, manifested, been born, come to pass. But what exactly *has* arrived, developed, manifested, etc. with this Three? You have to wait. “Waiting for ships to come in.” But you’re in a strong position. Maybe. In other situations it’s waiting in vain (as Bob Marley sang). So all our magical plans have brought us to this point of… ??? Nothing yet? You have set plans in motion. You have put the word out. You have let people know. You have gotten it all together. You did it! Crossed off the list! And now you stand at the TOP. Notice that. She/He is not at the bottom but at the top, looking down at those ships, that water, the water coming in, going out. Those are the messages, the communications. The FEEDBACK. This week isn’t for setting new boats afloat. This week is for the distance, which includes a call from that distant place. A call that comes back and back and back, like a wave. What ships are *you* waiting for? Previous post Mind, Money, Mercury, & Mary: The Stars This Week!